"Ukraine sees this agreement primarily as a comprehensive program of internal transformations in all areas of political, economic and social life of the state, as well as an efficient tool to improve national legislation," the head of state said at a meeting with heads of diplomatic missions of foreign states and international organizations accredited in Ukraine, the president's press service reported. Yanukovych stressed that Ukraine was ready for large-scale and hard work in order to ensure efficient implementation of the agreement. "This path enjoys full support of representatives of most of the political forces of our state and the society," the president said. He noted that at present they were one step away from the signing of the Association Agreement. 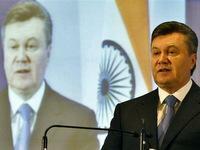 "I am confident that given the political will on both sides we can make it as quickly as possible," Yanukovych said. The president also told the diplomats that Ukraine will continue to work on economic aspects of its foreign policy. "The Ukrainian diplomacy, the Ukrainian foreign policy will always be present where there is a national interest. At present, the national interest is primarily economic interest. And so the line towards the economization of Ukraine's foreign policy will continue," the head of state assured. Speaking about Ukraine's cooperation with other countries, the president noted that at this stage they were successfully developing cooperation with Russia in all areas. In 2012, Ukraine also continued its strategic partnership relations with the U.S. "We continued active mutually beneficial cooperation in the field of non-proliferation, economic and education areas, at the level of civil society," he said.